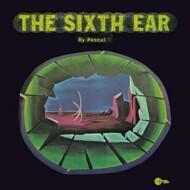 1972 saw the release of The Sixth Ear (Narco NR666), this time credited to Nik Pascal. A more complex work than Beyond The End..., it adds consistent rhythmic patterns to the mix with the addition of bongoes and also explores some interesting chord progressions. Besides his musical explorations, Nik was also an interesting painter. His paintings are auctioned from time to time, and are consciousness expanding works influenced by abstract cubism and surrealism, some kind of Salvador Dalí on drugs exploring the outter and inner space. All the artwork on the sleeves of his LPs is done by himself. Spacey landscapes and psychedelic colours that fit perfectly to the music they contain. Never reissued before on vinyl format, the Wah Wah reissue features original sleeve artwork made of paintings and drawings by Nik himself and reproduction of the famous ironic "Do not listen if you are stoned" sticker.